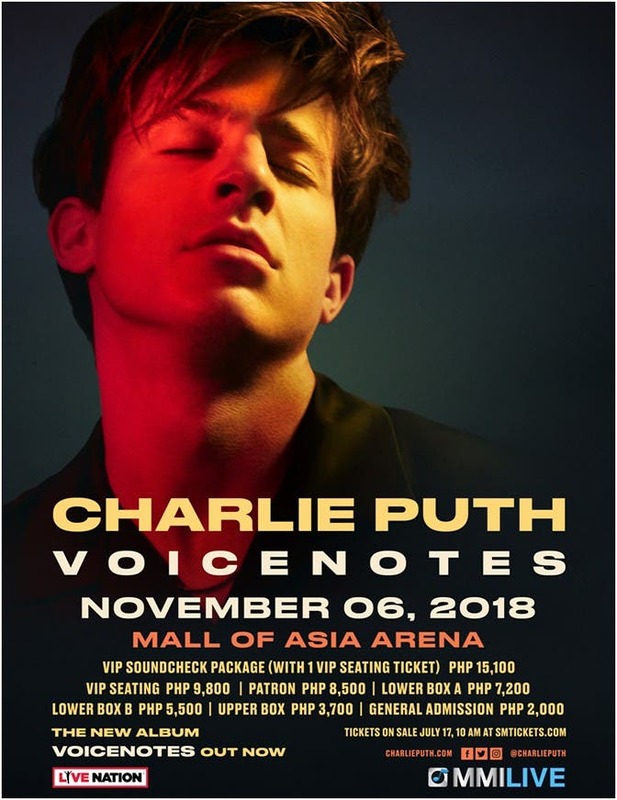 After revealing his highly anticipated Asian tour on social media, worldwide pop superstar and award-winning songwriter Charlie Puth confirms his return to Manila for “The Voicenotes Tour” at the Mall of Asia Arena on November 6, 2018. Concert promoters Live Nation and MMI Live also announce that tickets to the concert will be available at all SM tickets outlets on July 17, Tuesday at 10:00 AM. Charlie Puth was last in the Philippines in August 2016 and wowed thousands of his Filipino fans with the four multi-platinum hits “One Call Away,” “Marvin Gaye,” and “We Don’t Talk Anymore” from his platinum-selling, Top 10 debut album Nine Track Mind, as well as his breakout smash “See You Again” — the best-selling song of 2015 worldwide that spent 12 weeks atop the Billboard Hot 100, earned him three Grammy nominations (including Song of the Year) , a Golden Globe nomination, and 9x-platinum certification in the U.S. 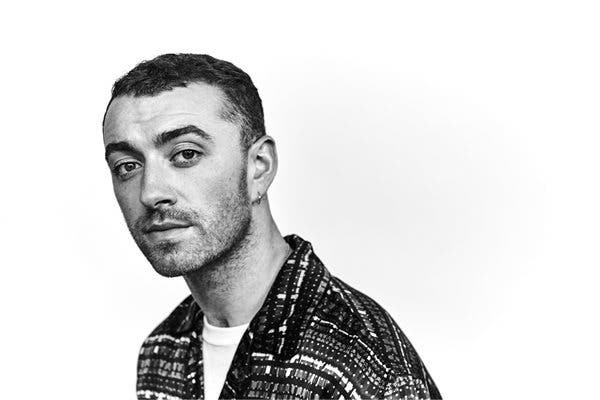 But the New Jersey-born singer, songwriter, musician, and producer was also eager to prove himself artistically when it came time to make his second album, Voicenotes, named after the trusty iPhone app he uses to collect his musical ideas. Puth co-wrote every song and recorded and produced the album entirely himself (barring one song he co-produced with Max Martin) mainly at his home studio in Los Angeles. A meticulously crafted game-changer replete with sparkling melodies and sleek, danceable grooves, Voicenotes decimates everything people may think they know about this musical polymath, who has not only written and produced his own massive hits, but also for other artists spanning a range of genres, including Jason Derulo, Trey Songz, Thomas Rhett, Maroon5, and G-Eazy. On Voicenotes, Puth allows himself to truly be seen, not only as an artist but also as a human, which meant stepping out from behind the detached façade of lovelorn balladeering and being transparent about his emotions and influences. On the lyrical front, Voicenotes is an album that is largely about Puth’s struggle of finding a normal relationship when his own life has hardly been normal since finding multiplatinum success, and the anxiety that pursuit has induced. “I wanted it to be a story of my travels from the East Coast to the West Coast and how my growing fame has affected my mind in good and bad ways,” he says. The first three singles—“Attention,” “How Long,” and “Done For Me” featuring Kehlani—cover that territory. “Whenever I met anybody, they often knew more about me than I knew about myself,” he says. “I’d never dealt with anything like that before. ”Songs like“ LA Girls,” “Like A Boy,” and “Slow It Down” detail different aspects of the rarified life of someone who feels like he should be enjoying the glittering lifestyle of fabulous parties and ample romantic opportunities, but just doesn’t—something Puth addresses on self-acceptance anthem “The Way I Am,” which opens with the following lines: “Maybe I’m a get a little anxious/Maybe I’m a get a little shy/Cuz everybody’s trying to be famous/And I’m just trying to find a place to hide”). To achieve his goal of making people want to “dance and cry at the same time,” Puth allowed his love for jazz and late’80s/early’90s R&B to shine through, which upped the music’s sophistication level several notches. Voicenotes’ up-tempo, groove-minded songs like “Attention,” “How Long,” “Done For Me,” and “The Way I Am” are so effortlessly catchy that they seem simple on the surface, but are hardly that. Puth, whose perfect pitch means he is often distracted by identifying the notes sounded by passing car horns and leaf-blowers, began studying jazz at age 10 and attended both the Manhattan School of Music Pre-College, where he majored in jazz piano, and Berklee College of Music, where he graduated with a degree in music production and engineering. His classical training is on full display, along with his impeccable influences, which range from jazz greats Miles Davis, John Coltrane, and Bill Evans to R&B songwriter-producers Babyface, Jimmy Jam and Terry Lewis, and Teddy Riley. “I was influenced by artists who were proving something when they broke off from their groups,” Puth says, citing Bobby Brown and Ralph Tresvant after New Edition, Steve Perry after Journey, and George Michael after Wham!. “When George left Wham!, he wanted to show the world that he could produce records like ‘Careless Whisper’ and ‘Father Figure’ on his own,” Puth says. “He didn’t do it in a vengeful way. He was just showing people how musical he was. That was really my goal as well.” Puth’s musical heroes turn up on two of Voicenotes’ tracks, “If You Leave Me Now,” featuring Boys II Men (“What they sent me was perfect; it was the first time I didn’t have to do anything to finish a song”) and “Change,” featuring his idol James Taylor (“I never thought I’d be able to do a song with him and when I met him, it confirmed in my mind that I want to have a career just like his”). Audiences have embraced Puth’s bold new direction. “Attention,” which the New York Times pop critic Jon Caramanica listed fourth on his year-end list of “Best Songs of 2017,” climbed to No. 5 on the Billboard Hot 100 (Puth’s highest-charting single as a solo artist), hit No. 1 on both the Top 40 and Hot AC radio charts, and has been certified 3x-platinum, while the funky, cheating-ex song “How Long“hit No. 3 at Top 40 radio and has been certified platinum. For complete concert details and ticket information, please visit www.smtickets.com or follow MMI Live (on Facebook), and @mmilive (on Instagram, and Twitter), or visit mmilive.com for details.